FCC ETL RoHS Certified makes it more trustworthy. protection to protect you and you family. GinCuky Smart Plug works with Wi-Fi router without the need for a separate hub or paid subscription service. Step 4: Discover the smart plug and control your device with voice. 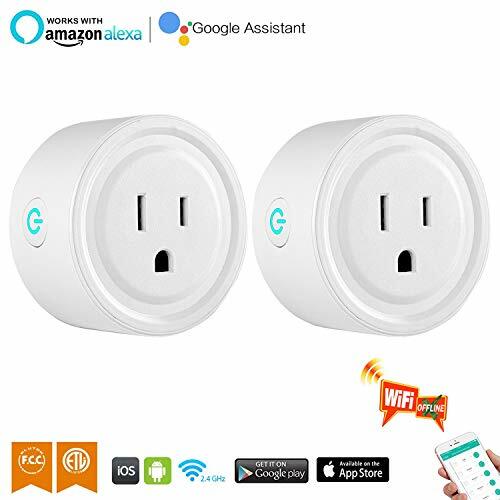  Make Home Smarter: The smart plug works with Amazon Alexa / Google Home / IFTTT.Remote control your lights and appliances through "TuyaSmart"or"Smart Life"free app.Supports Android and iOS operating system.Only needs Wi-Fi,No hub required.  Smart Voice Control: The Smart Plug Compatible with Amazon Alexa / Google Assistant and IFTTT for voice control,you can use simple voice command to turn On/Off your lights and appliances, provide your life more convenience.  Time Schedule: The smart plug supports countdown and timing functions and can repeat the daily ON/OFF cycle during weekdays and weekends.Turn on/off the light, air-conditioner, power charger or Water heaters automatically after setting the specific time. perfect for cooking or lighting at dawn and dusk.Reduce wasteful stand by power,the timers feature helps you save on the electric bills.  Away Mode: This smart plug helps improve your home security by turning your devices on and off at different times to give the appearance that someone is home even while you're traveling.Do not exceed the maximum load current of 10A. It only supports a 2.4GHz Wi-Fi network.  Satisfaction Guaranteed : The smart plug provides a Quality Assurance, 3 Months Replacement and 12 Months Warranty.ETL& FCC certification,let you buy the Mini Wifi Smart Plug with confidence. GIFT FOR YOU: A Cellphone Finger Ring Holder.If you have any problems during use, don't worry, because this is not a problem with the product. This smart socket may not be used by customers who purchase for the first time. You can contact us and we will help you solve this problem. If you have any questions about this product by GinCuky, contact us by completing and submitting the form below. If you are looking for a specif part number, please include it with your message.